Are We Made of Lace? Handmade bobbin lace techniques: Panel I – braids and tallies, Panel II – tape lace, Panel III – tape lace with tallies, Panel IV – ground with gimp, Panel V – chantilly lace, Panel VI – tape with half stitch. This piece was created for the International Lace Award Competition organized by Powerhouse Museum in Sydney, Australia. It was selected as a finalist and was exhibited in the Powerhouse Museum “Love Lace” exhibition in 2012 – 2013. When I make lace, I am totally at peace and in sync with the inner rhythm. When I study lace, I feel like I am conversing with the lacemakers of the past. When I design lace, patterns are coming as I need them. I am in a special state of mind. I generally do not experience this type of deep connection in any other activity, and it makes me wonder what is so unique in lace. In our modern time, there is no rational explanation for it, and I would consider it abnormal – if I had not met other lacemakers. Beginners or advanced experts, they all share the primal attraction to the intricate lace structure or to the process of making it. As if there was something deeper meaning in it. When I came across scanning electron microscope images, it felt like finding the missing piece of the puzzle. The images of cells structures look exactly like lace. 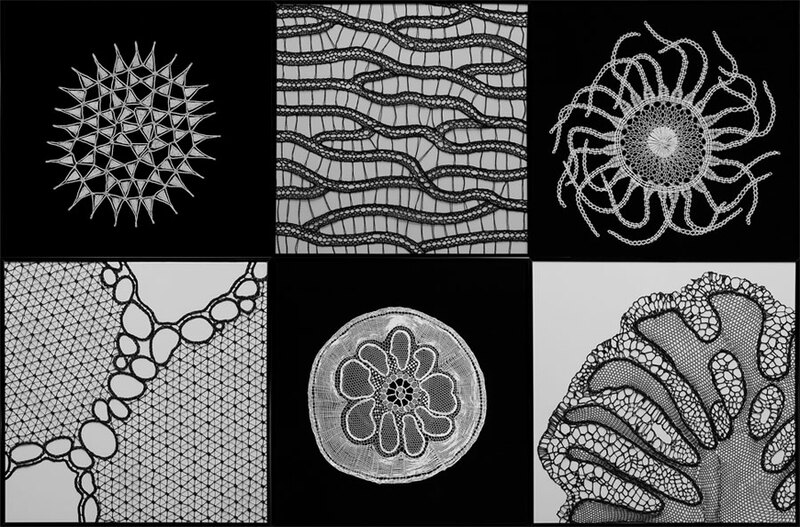 Plants, sea plankton, humans… all made from a primordial lace that cannot be seen with unaided eye, but it pervades everything. I found the answer to my question: We live in awesome lace world! Copyright © 2014 Lenka Suchanek. All rights reserved. This work was created for the International Lace Competition of the 14th Edition of the Biennale Internazionale del Merletto in Sansepolcro, Italy, 2010. It is now in the Centro Culturale Sansepolcro’s International Lace Biennial Collection. Sandro Botticelli’s art has significantly influenced my work. He was one of the first artists to paint gold lace decoration on garments; therefore his paintings are invaluable for my research of early metal laces. Lace was painted in such exquisite technique, that it is possible to trace many original patterns of braided laces in a minute detail. 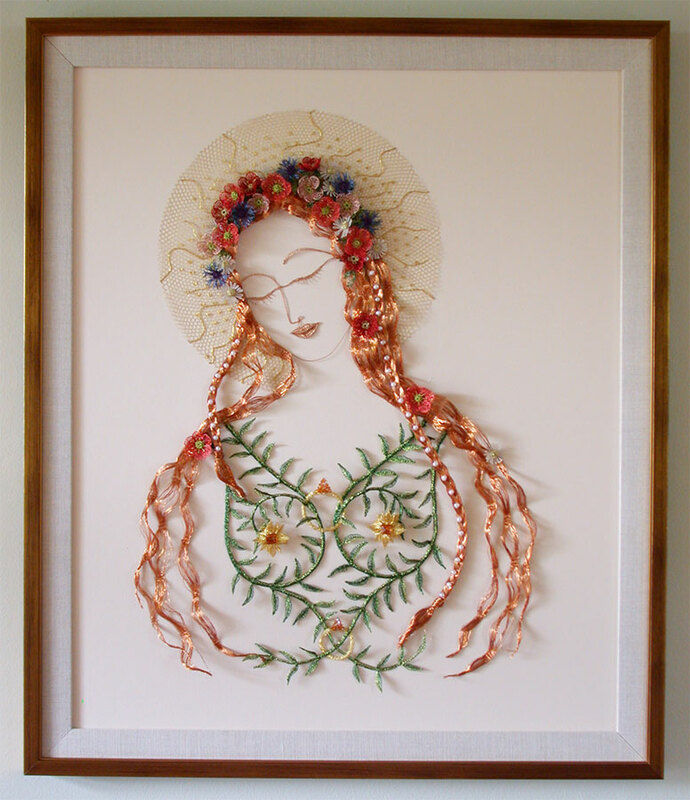 I haven’t found any written records about gold bobbin lace from that time, thus Botticelli’s work has remained the essential source for my lace work. I fell in love with his paintings not only because of lace. I have also found great inspiration in the way Botticelli portrayed women in his paintings. His ability to capture female inner beauty and strength is awe-inspiring. Loving and compassionate gaze of his Madonnas and goddesses reveals deep spiritual dimension with radiance that has not been surpassed by any other painter. Botticelli’s genius gave a visual form to Dante’s poetry – Beatrice became alive in his paintings and brought Divine Love to the Earth. Copyright © 2014-17 Lenka Suchanek. All rights reserved. 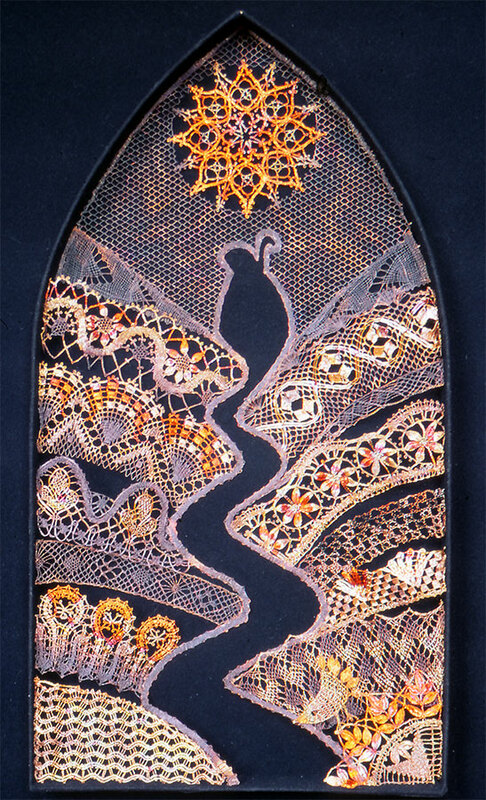 This work was created for the IX Edition of the International Lace Biennial in Sansepolcro, Italy, in year 2000. It was accepted and received a Jubilee Gold Medal in the Jubilee Exhibition and a Certificate of Merit in the International Competition with a theme “Lace for the Third Millenium: avantgarde, experiment, challenge, renewal”.